By carefully following these steps this beginner guide will help you create your empire quickly and efficiently. Following the tutorial is your first task however you should read through the notes in this guide before advancing through each of those first 17 levels. 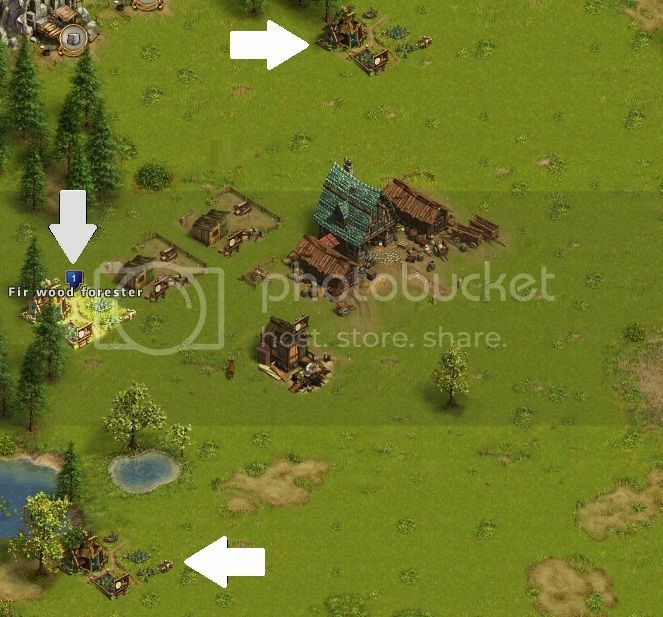 If you are an experienced Settlers player, keep in mind that things work different here so PAY ATTENTION. • If you want your city to have a certain look, PLAN AHEAD! Moving buildings gets costly and should be avoided if possible. 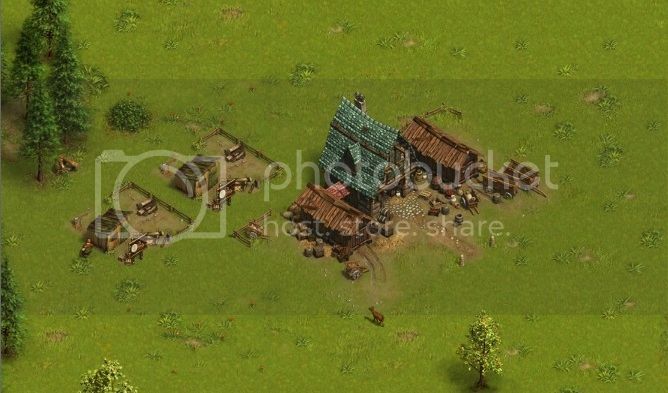 • Production buildings should be placed as close as possible to the front corner of the Mayors House or a store house to maximize production time. Workers will have to walk around the building to reach the front corner, which will increase production time. 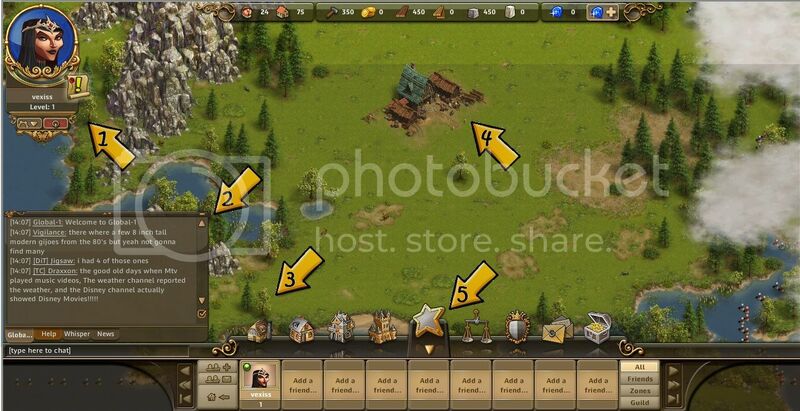 Production time will be faster than if you placed the building close to the resource. Ex: a Fisher placed in front of the Mayor’s House has a production time of 4min, 12sec. If you place it directly next to the Fish resource south of the Mayors house it will be 4min, 36sec. The exception would be resources that are harvested (fir wood, stone, etc.) It is better to place these close to the resource and save the room around the Mayor’s house for production. • Place buildings close together so you don’t waste space. • Keep your explorers busy looking for treasure. It doesn’t cost you anything to send him out, and you can advance faster with the materials he will find early on in the game. 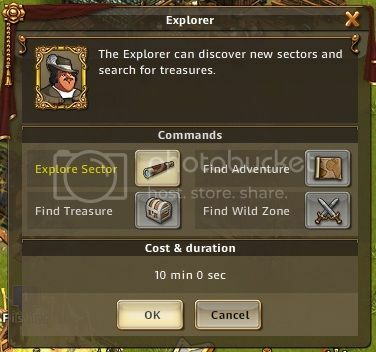 Purchase a second explorer as soon as you have enough gold, he is well worth the investment! • Your first gem purchase should be a Noble Residence. It will increase your population by 30 and save you having to use a building license. • You cannot create tools until level 11, so make sure you do not create more buildings than recommended below so you do not run out. • Keep an eye on your storage and upgrade as needed. Until you can upgrade try placing extra storehouses (you will probably delete them later so you do not use up all your building licenses. • Build multiple wells and fields since they do not take up any building licenses. If your going to be offline longer than usual build some extras so you do not run out. • Tree placement will not change, as trees are cut down stumps will appear if you do not have a forester. You cannot clear land, building placement options will not change. • Goods are available from all storehouses equally, so goods do not have to be transported between them in order to be available at distant locations. • For buildings that work in a “chain” (copper mine->copper smelter -> toolmaker) place the raw material buildings closest to the storehouse and chain the buildings out in order from there. That way you do not run out of materials due to production times. • Building count will be important in chain production. Keep an eye on production times as well as necessary quantities needed to determine how many buildings you need. • Do not upgrade a building until you are certain you will not be deleting or moving it. • To maximize efficiency building upgrades should be done on buildings at the beginning of chains first. Buffs should be done on buildings at the end of the chain. • Don’t forget buffs, especially on resources that are expensive to get or run out quickly. Buffing will double your production without costing any extra resources. Trade buffs with your friends as much as possible to increase the active time on buffs. • Early on you will have tons of building licenses. Take advantage of these and create extra stone masons and fir wood cutters to maximize available materials. Tear them down once you run short on building licenses. • Do not buff your fisher until you upgrade it to level 2. While it will double your production, it takes more time to create the buff plate in the first place. • DO NOT SPEND GOLD COINS IN THE MARKETPLACE! While it is tempting you want to save your gold for building upgrades and purchasing a secondary explorer. Review these tips as you advance so you do not waste resources or make costly mistakes. Ok, time to play! Keep in mind that placement suggestions are for maximum production time, but it is up to you. If you have a design or look in mind you can layout as you desire. 1. This shows your level and personal information. The ! is your current quest. Underneath your user pic will be a green bar showing your progress to the next level. 2. This is your chat window. You can ask questions in the HELP tab. Click on the WHISPER tab to whisper to a friend or see what a friend has whispered to you. The NEWS tab shows you the events in your empire since you logged on. 3. This is your first BUILD section. Click on it to select a building to place. 4. This is your MAYORS HOUSE. You cannot move this building. It will be the center of your operations, and where your goods are stored. 5. This is your STAR MENU. Click on it to interact with your specialists. When you create buffs they will appear here. Any items your EXPLORER finds will appear here also. 2 woodcutters produce enough to keep a sawmill busy, but you will need wood for other things so add more woodcutters and sawmills as soon as you can. Once you reach level 11 and can produce tools add a couple more sawmills if you want. The next level adds the forester. Foresters will plant trees so that the woodcutters do not run out of raw materials. 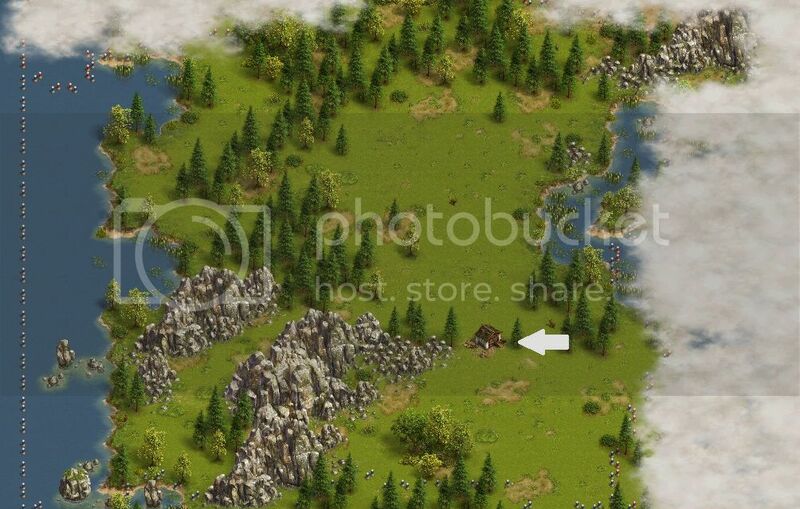 You should build 3 foresters for every 2 woodcutters that you have. Place 3 of them to the north and the west of your Mayors house. Once you have a forester placed you will get your first specialist, the geologist. Send him out looking for stone as soon as you get him. Open your star menu and the following window will pop up. Select “find stone deposit”, then hit OK.
Once your geologist has found stone you will gain another level. The location of the stone your geologist finds varies. It can be either to the north or to the south. If you want to find more stone you can send out your geologist again now. I suggest you send him out until he finds stone to the north of the Mayor’s House. Regardless of where the stone is found you are ready to place your first masons. Place 1 of them to the north of your Mayor’s House as shown below in order to reach level 5. Now you are ready to place your first residential house. Every building requires a worker. Wells also require a worker. 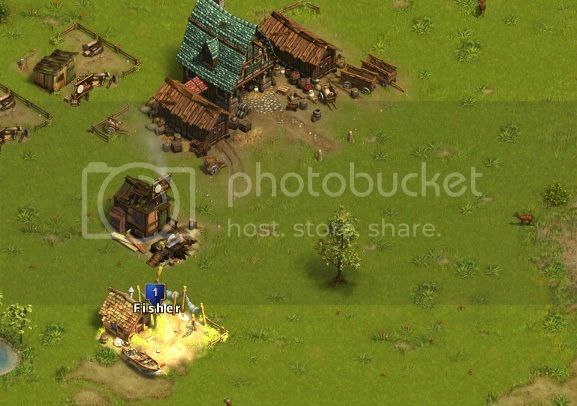 The remaining settlers are used to build your troops. You start with a maximum of 50 settlers. Each Residence will allow you to add 10 more settlers. 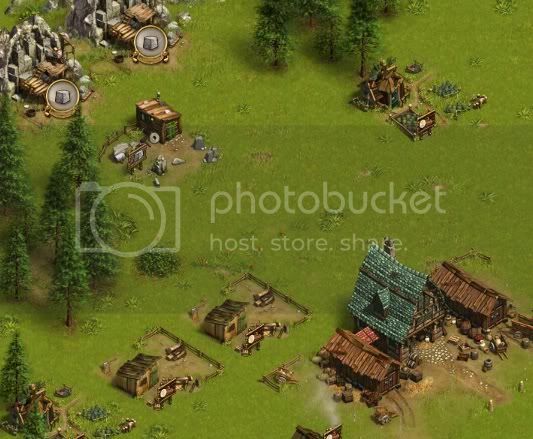 IMPORTANT: later in the game you will most likely want to tear down your residence and replace them all with noble residences, which add 30 settlers.. I would avoid upgrading any of your residences because of this. Residences do not have a production time, so their location does not matter. It is best to place them at the edges of your zones, leaving the space close to your Mayor’s house open. For now just place one residence to reach the next level. A good location is either on the north boarder, or to the south by the water. The next task is to create a Provision’s House. This is where you will create buffs and other special items out of goods. This building does not rely on location to a storehouse for production time, so it is best to place it farther away from the Mayor’s House. You only get one of these, and you only get one chance to place it so make sure you like where you place it. Place one Provision’s House as shown below. OPTIONAL: This building takes a little while to build. 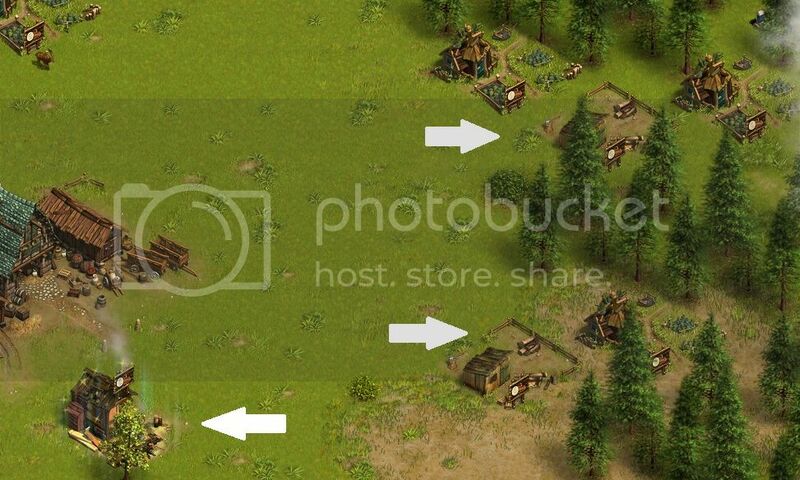 You can use this time to place 2 cutters, 3 foresters and another sawmill as shown below if you choose. This will allow your Fir wood planks to replenish a lot faster. Once your Provision’s house is done you will get a quest to create a fish plate. Click on your Provision’s house to open the menu shown below. Click on the Fishplate, then click OK. Notice the slider that will allow you to create a stack of up to 25 at a time. In the future you can choose to create an entire stack, but for now we just need one. Each Fishplate takes one minute to create. Once the Fishplate is finished you will get a quest to use it to buff a building. It is best to buff buildings that are at the end of a chain. In this case, that would be a sawmill. Open your star menu and click on the Fishplate. DO NOT BUFF YOUR FISHER until it is at least level 2, since it will take longer to create enough fish than the buff time of 30 min. At this point you will get a new specialist, the Explorer. The next quest is to send him out to map a new sector. Open your star menu and choose your explorer. Click on the Explore Sector Icon, then click OK. He will take 10 minutes to find the new sector, which should be to the north. Once he has found this you will be level 8. NOTE: The Explorer can also Find Treasure. At first he can only do the “quick” treasure hunt which takes 6 hours. Once he is done you can send him out again. Keep him busy as much as you can. He will find you resources and gold, which will be very helpful. All items he finds will be placed in your star menu once you accept them (through the mail system). Where you place a storehouse is important, since production times will depend on how close your production buildings can get to it. Place a store house as shown below in the new sector. This placement will allow building of production to the north, south and east. To the west will be your copper mines. This building will take 10 minutes to complete. If you want, you can create another stone mason in the south by the stone mine. Once this building is placed you will have gained a new sector and another level. You can now build copper mines. First you need to send your Geologist out to find copper. Click on the star menu and select the Geologist. Click on copper, then OK. He will take 10 minutes to find copper. OPTIONAL: During this time you could create another set of 2 cutters and 3 foresters in the top of the new sector. Space them out a little bit so you do not run out of raw resources close to your cutters. Once he finds copper you can place your first mine. The copper mine is located under the INTERMEDIATE buildings tab. Unlike masons, mines must be placed directly on the found ore location. Once the mine is built you will be level 10. Your next quest will be to build a coking plant for coal. Place it next to your storehouse in the north. You will now start getting gold and gems for rewards. Spend your gems on a Noble Residence deed as soon as you get 95. SAVE the gold for building upgrades and to purchase an additional Explorer. At this point you should have a good feel for the game. Building quests will go through level 17. Keep in mind that these are estimated and do not include the benefits of buffing or upgrading buildings. Use buffs as often as you can to balance out the ratios until you get a good balance of buildings. A level 2 building will equal 2 buildings, a level 3 building will equal 3 buildings. Once you have a good balance on your buildings you should buff the buildings at the end of your production chains first, then work your way down the chain. When Upgrading buildings focus on the beginning of your chains. Quest is to build a copper smelter and a toolmaker. 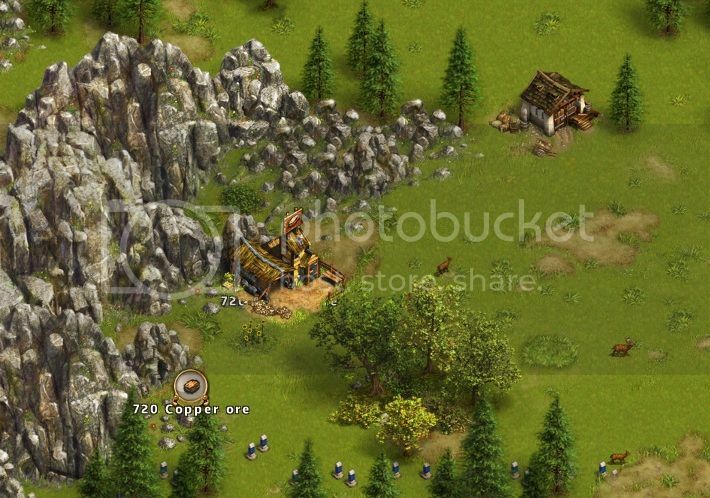 Since you will need at least 2 copper smelters (1 for toolmaker one for weapon smith) build a second one as soon as possible. You will also need at least 1 or 2 more Coking Plants soon so build them as well. Your next quest is to build a Barracks. Like housing, placement does not need to be close to storage, so place it on a boarder. 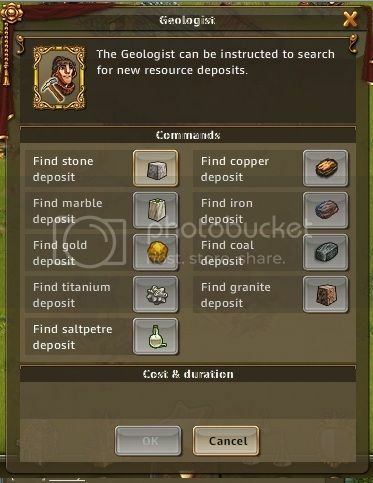 Once the Barracks is build you get a quest to open up the Barracks and look at what resources you need for troops. Open the window and click on the Recruit. Each Recruit will take 5 Beers and 10 Bronze Swords to create. Close the window to complete the quest. For this level you will start creating Beer. You need to build a Farm, Wheat Field, Well and Brewery. If you have the resources it is a good idea to create a Store House in an open area, and build your brewery chain around it. Each Field can be used by several Farms. You will need to replace Fields and Wells when they are depleted. You can simply place a new plot on top of the depleted plot, there is no need to tear down the old one. Fields and Wells do not use up a Building License, but a Well will take a Settler. Now that you can produce Beer your ready to start making bronze swords. Place your Bronze Weapon smith and start creating swords. Once your first sword is created, you will get a quest to upgrade a building. This is one of your most important quests. You will not be able to upgrade more buildings until level 17, and not until you create enough hardwood and marble to do so. At this point you will need bronze and coal. Now is a good time to place another Coking Plant and Copper Smelter. Take a look at your production and determine which resources you run out of the fastest. You may want to place more masons, toolmakers, or farms to keep up with production. Ideally you want to keep a reserve of each resource, but you do not want it growing so fast that you fill your storage area. If this is the case, you can either build more storage or you can stop production on a building for awhile. Fisher: once this building is upgraded you can start buffing it to increase production. If you find yourself low on fish to create buffs, this is a good choice. Storehouse: Are you always running out of space? 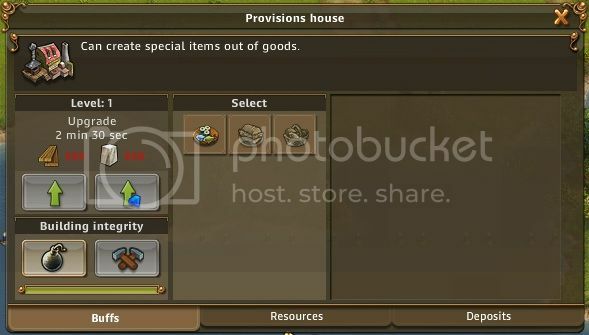 Upgrading your storehouse will give you an additional 400 spaces for inventory. Copper Smelter: Do you find yourself running out of bronze? This upgrade could help keep up with the needs of the tool maker and the bronze weapon smith. Tool Maker: Always waiting on tools, or having to use up resources to create them in your provision house? Upgrade this building to increase your tool production. 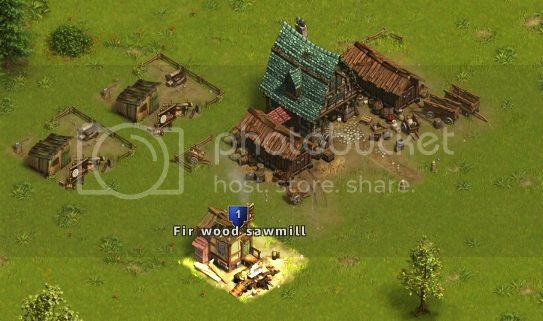 Fir Wood Cutter, Forester and Sawmill: These buildings are very cheap to create and can be torn down later if you need more licenses. Well: Very cheap to create, and will eventually run dry and need to be replaced. Residence: Once you can create the Noble Residence you will most likely want to delete all of these and replace them to preserve you licenses. Bronze weapon smith: While this may seem like a good choice at first, it can quickly use up all of your available building licenses. Once bronze weapon smith needs 4-6 resource buildings to keep it running (1-2 copper smelters, copper mine, 1-2 coking plants, 1 fir cutter). An upgraded bronze weapon smith needs a minimum of 8 resource buildings to keep it running smoothly. The next quest is to create a Tavern and hire a General. Place the tavern on your boarders, or somewhere far from your storehouses. Once the Tavern is done being created open the menu and click on the buy general button. The general will be moved to your star menu. Open your star menu and click on your general. Your cursor will change to a bugle icon. Place this icon anywhere you would like to create your garrison. It can be moved at anytime by opening it and hitting transfer, then selecting a new location. Once it is finished building you need to open it up and assign your recruits to it by sliding the bar under the recruits and hitting OK.
You now need to defeat a bandit camp. There are bandit camps to the north and to the east. Select one with very few troops for your first battle. You will need to have enough troops to win. For this first battle have at least 1.5 recruits for each scavenger in the camp. Open your garrison and hit the attack button. 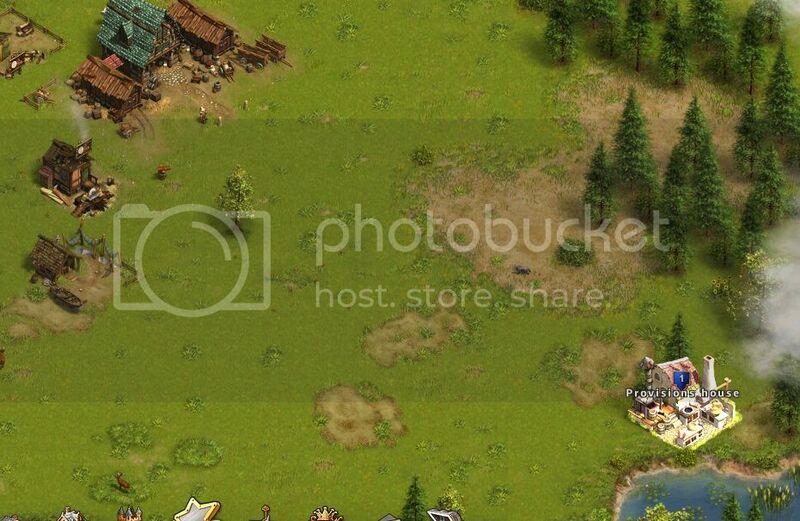 Place the icon on the selected bandit camp and click to send your troops. Make sure you do not cross paths with any other bandit camps! Once the battle is won you will gain another level and be ready to create a bakery, mill and bowmaker. At this point in the game the leveling will be done through combat. I hope this guide will help you get started in the game. For hints on combat please check the forums, there are many guides to help you learn the combat system. A big thanks to Aurorah for all the help in creating this Guide!